Custom 3.875x3.875x1.9375 memo cubes – 3 colors, 2 designs not only offer a large creative space for marketers to spread out, but also assured visibility and easy acceptance. People would be happier to receive a memo cube, which offers large scribbling space and comes to their rescue in various other capacities. 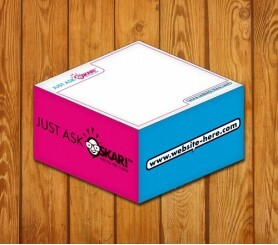 There is hardly any other promotional gift as personalized note cubes, which offer great visibility against investment. Marketers sourcing their personalized memo cubes from us can save on online design proof and art setup assistance. Request a quote to know price cuts that you can avail for wholesale promotional 3.875x3.875x1.9375 memo cubes – 3 colors, 2 designs. * Price includes 3 standard colors screen printed SPOT and 2 side designs. Sheet imprints offered on orders of 250 or more.